Microsoft has open-sourced Project Orleans a framework for writing highly scalable services that aims to simplify development of scalable cloud services. The problem addressed by Orleans is that of creating interactive services that are scalable and reliable. As pointed out by Sergey Bykov, Lead Software Engineer, interactivity imposes strict constraints on availability and latency, as that directly impacts end-user experience. To support a large number of concurrent user sessions, high throughput is essential. A three-tier architecture with stateless front-ends, stateless middle tier and a storage layer has limited scalability due to latency and throughput limits of the storage layer, which has to be consulted for every request. The traditional remedy for this is to add a caching layer between the middle tier and the storage to improve performance. This means you lose most of the concurrency and semantic guarantees of the underlying storage layer, so the cache manager has to have concurrency control to prevent inconsistencies caused by concurrent updates to a cached item. Using a stateless middle tier means that for every request, data is sent from storage or cache to the middle tier server that is processing the request. This is known as the data shipping paradigm. The alternative solution used by Orleans is to use the actor model. This relies on the function shipping paradigm, which treats computation as the evaluation of mathematical functions and avoids changing-state and mutable data. The actor model uses “actors” as the basic entity for concurrent computation. When an actor receives a message, it can do things such as create another actor, send a message, make some local decision, or work out what to do when the next message is received. 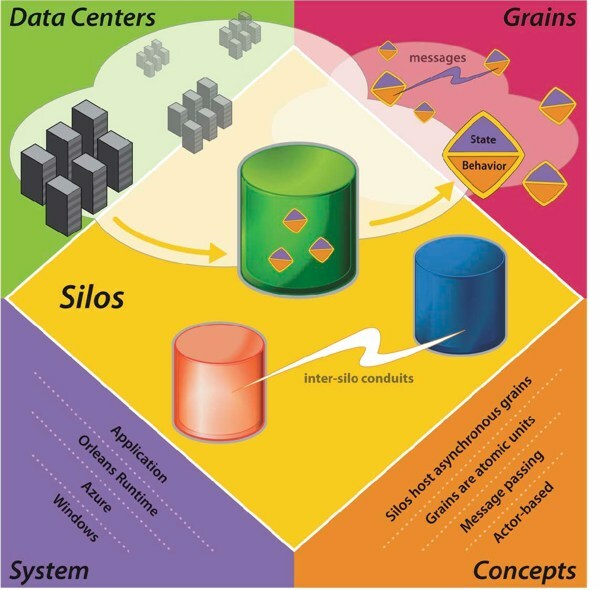 Using actors enables the building of a stateful middle tier. This gives you the performance benefits of a cache, but holds data locally, and offers the semantic and consistency benefits of encapsulated entities by using application-specific operations. Actor platforms such as Erlang and Akka make it easier to program distributed systems, but you still need to know what you’re doing in terms of the system services. Orleans is designed to offer higher levels of actor abstraction. It is actor-based, but differs from existing actor-based platforms by treating actors as virtual entities, not as physical ones. An Orleans actor always exists virtually. It cannot be explicitly created or destroyed, and its existence transcends the lifetime of any of its in-memory instantiations. Orleans actors are automatically instantiated: if there is no in-memory instance of an actor, a message sent to the actor causes a new instance to be created on an available server. An unused actor instance is automatically reclaimed as part of runtime resource management. Actors never fail: if a server S crashes, the next message sent to an actor A that was running on S causes Orleans to automatically re-instantiate A on another server, eliminating the need for applications to supervise and explicitly re-create failed actors. The location of the actor instance is transparent to the application code, and Orleans can automatically create multiple instances of the same stateless actor, seamlessly scaling out hot actors. Overall, Orleans gives developers a virtual “actor space” that lets them invoke any actor in the system, whether or not it is present in memory. The use of virtualization to map virtual actors to their physical instantiations means the runtime can take care of many hard distributed systems problems that would otherwise have to be handled by the developer, such as actor placement and load balancing, deactivation of unused actors, and actor recovery after server failures. Orleans has already been used to build multiple production services currently running on the Microsoft Windows Azure cloud, including the back-end services for Halo 4, and that this enabled the project team to validate the scalability and reliability of production applications written using it, and adjust its model and implementation based on this feedback. Now it is on GitHub it is available for others to use. As a part of our ASP.NET 5 cross-platform efforts, we are actively working on making applications written in ASP.NET 5 easy to deploy and ship on Linux and Mac OS X. A while ago, we have released the first official Docker image by Microsoft: the ASP.NET 5 Preview Docker Image. Docker is an open source project that makes it easier to run applications in sandboxed application containers on Linux. With the ASP.NET 5 Docker image, you can get a base image where the ASP.NET 5 bits are already installed to run on Linux for you. All you need to do is add your application to the image and ship it so it will run in an app container! In this tutorial we will show how a simple application written in ASP.NET 5 Preview can be deployed to a Linux Virtual Machine running on Microsoft Azure cloud using Docker. The tutorial can be executed on a Linux or Mac OS X machine where Docker client is installed (or you can ssh into the Linux VM you will use). Once Windows client for Docker is available, you will be able to run these commands on Windows and once Windows Server container support comes out you will be able to use Docker to manage Windows Server containers. NOTE: Both ASP.NET 5 (vNext) and the Docker image are in preview and the following instructions are subject to change in the future. Please refer to Docker Hub page and GitHub repository for latest documentation on how to use the Docker image for ASP.NET 5. As Docker only runs on Linux today, you will need a Linux machine or VM to run Docker on your server. You can find Docker installation instructions here or follow the Getting Started with Docker on Azure to get a Docker-ready Linux VM on Azure. In this tutorial we will assume you have a Linux Virtual Machine on Azure with Docker installed. If you are using some other machine, most of this tutorial will still be relevant. In order to deliver your ASP.NET application to the cloud, you will need to create a container image containing your application. Docker container images are layers on top of each other. This means your application is an addition on top of a “base image” –in this case the base image will be microsoft/aspnet. The image layers are stored as diffs, therefore while deploying your application, your image will not contain the Linux distribution or the ASP.NET binaries; it will only contain your application, making it small in size and quickly deployable. Creating a Docker image is done using a file called Dockerfile. Similar to a Makefile, the Dockerfile contains instructions telling Docker how to build the image. Let’s go through this Dockerfile line by line. The first FROM line tells Docker that we will use the official ASP.NET image on Docker Hub as our base image. The COPY line tells Docker that we will copy contents of this folder (.) to the /app directory of the container and the WORKDIR instruction will move to the /app directory. The RUN instruction tells Docker to run the kpm restore command to install the dependencies of the application. We do this before running out application for the first time. The EXPOSE instruction will inform Docker that this image has a service which will be listening at port 5004 (see project.json of the sample file for details). 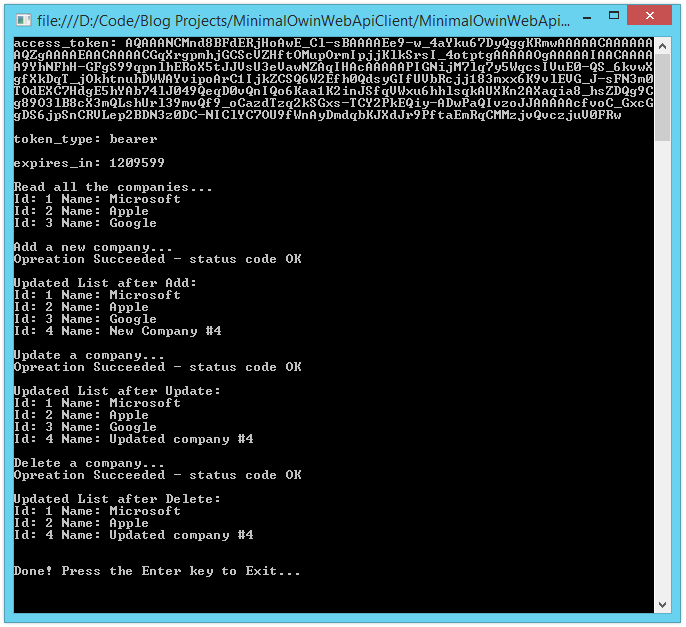 Lastly, the ENTRYPOINT instruction is the command executed to start the container and keep it up and running. In this case it is the k kestrelcommand, starting the Kestrel development server for ASP.NET 5. Once executed, this process will start listening to HTTP connections coming from port 5004. As you can see, your app and the ASP.NET image are listed as images that exist on your machine. Now we are ready to deploy our application to the cloud. The -t switch attaches a pseudo-tty to the container (this switch will not be necessary in future versions of ASP.NET 5). The -d switch runs the container in the background, otherwise the web server’s standard input/output streams would be attached to our development machine’s shell. The -p switch maps port 80 of the VM to port 5004 of the container. In this case, connections coming to port 80 of the VM will be forwarded to our container listening on port 5004. Lastly, myapp is the Docker image name we are using to start the container. We built this image in the previous step. Our container has started! However, we are not quite done yet. We need to complete the endpoint port mapping for Azure VM. You need to go to the Azure Management Portal to map public TCP port 80 to internal port 80 on your Linux VM (see relevant tutorial here). Voila, you have an ASP.NET 5 application running on Linux inside a Docker container! If your application is slightly different than the single-project sample application we used, you can learn more about writing Dockerfiles here and build your own images with custom commands. We will continue to invest in running ASP.NET 5 applications on Linux and Docker and we are happy to bring you the Microsoft’s first official Docker image: ASP.NET 5 Preview Image. Since this tutorial depends on previews of ASP.NET 5 and its Docker image, the exact usage instructions may change over time. Please head over to Docker Hub page or GitHub repository to see up-to-date instructions. Please send us your feedback and help us improve this Docker image by opening new issues on GitHub repository. The ASP.NET team provides exceptional project templates that allow developers to get started easily building web applications. The templates are structured in a way which provides a basic, boilerplate functionality for getting up and running easily. The basic application infrastructure is all in place, and all the Nuget packages and framework references you might need are all there, ready to go. This is all great, but also creates a two-pronged problem, particularly for those still learning web development in general, and how to navigate the innards of ASP.NET MVC and Web Api Application development specifically. First off, the generalized approach showcased in the VS project templates tends to include a good deal more “stuff” than any one application needs. In order to provide sufficient functionality out of the box to get devs up and running quickly, and to provide a starting point for a broad variety of basic application requirements, the templates in Visual Studio bring with them a good deal of infrastructure and libraries you don’t need for your specific application. Secondly, the templates knit together complete, ready-to-run applications in such a way that a whole lot appears to happen “by magic” behind the scenes, and it can be difficult to understand how these individual pieces fit together. This begins to matter when we want to customize our application, cut out unwanted components, or take a different architectural approach to building our application. Understanding how these components fit together, and the notion of the middleware pipeline will become increasingly important as ASP.NET 5 (“vNext”) moves closer and closer to release. While the implementation of the the middleware pipeline itself will change somewhat with the coming release, the concepts will apply even more strongly, and more globally to the ASP.NET ecosystem. 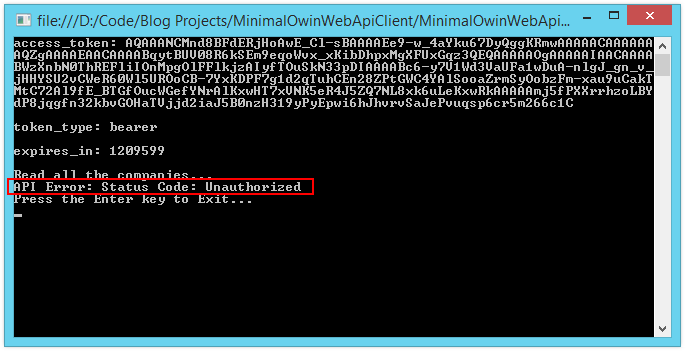 In the next post, we examine adding OWIN-based authentication and authorization to our Web Api application. The source code for the example projects used in this post can be found in my Github repo. There are two branches for the self-hosted Web Api Application, one with the basic API structure in place, and one after we add Entity Framework and a database to the equation. As of ASP.NET 4.5.1, Web Api can be used as middleware in an OWIN/Katana environment. In a previous post wetook a look at how the OWIN/Katana middleware pipeline can form the backbone, so to speak, of a modern ASP.NET web application. The OWIN specification establishes a distinction between the host process, the web server, and a web application. 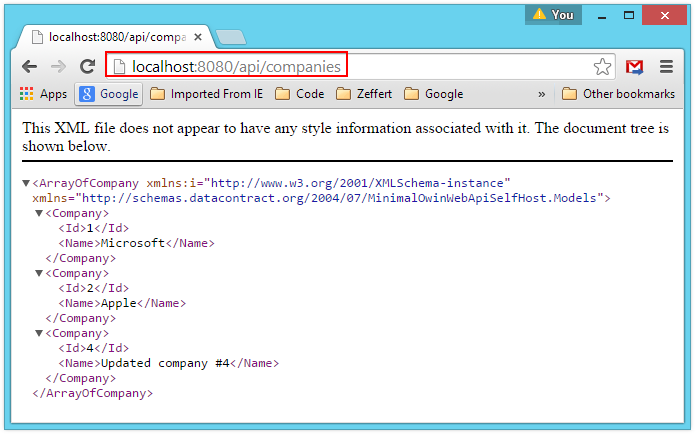 IIS, in conjunction with ASP.NET, acts as both the host process and the server. The System.Web library, a heavy, all-things-to-all-people library, is tightly coupled to IIS. Web Applications with components which rely onSystem.Web, such as MVC (for the moment, until MVC 6 “vNext”) and Web Forms are the likewise bound to IIS. 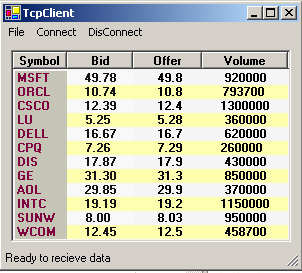 In the standard ASP.NET Web Api project template, Web Api is configured as part of the IIS/ASP.NET processing pipeline, as is MVC and most of the other ASP.NET project components (Identity 2.0 is a notable exception, in that Identity uses the OWIN pipeline by default in all of the project templates). However, beginning with ASP.NET 4.5.1, Web Api (and SignalR) can also be configured to run in an OWIN pipeline, relieved of reliance upon the infrastructure provided by IIS and the monolithic System.Web library. 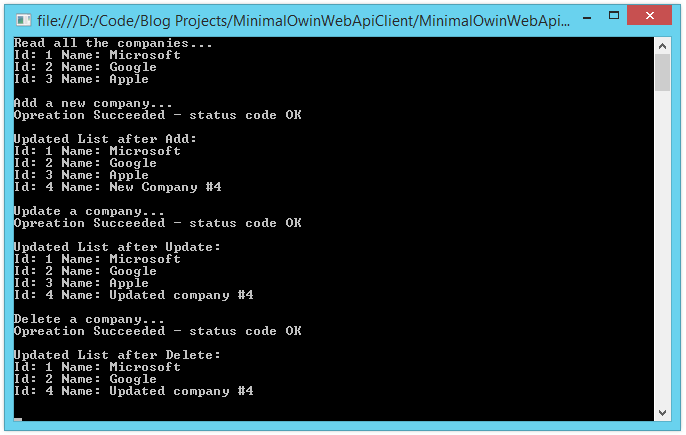 In this post, we will configure Web Api as a middleware component in a lightweight OWIN-based application, shedding the dependency on the heavy System.Web library. 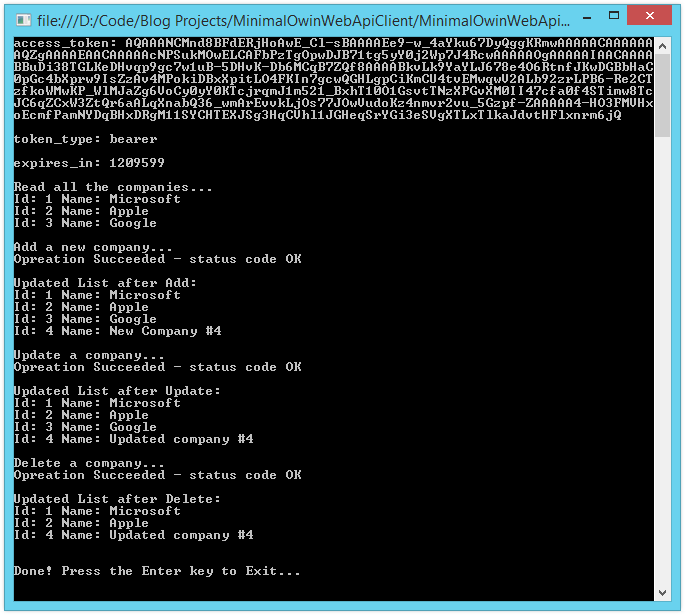 When we want to use ASP.NET Web Api as a component in an OWIN-based application, we can do something similar. The Microsot.AspNet.WebApi.Owin package provides us with the UseWebApi() hook, which we will use to plug Web Api into a stripped-down, minimal application. First, we’ll look at creating a simple self-hosted Web Api, and then we will see about using the Katana pipeline to use Web Api in an application hosted on IIS, but forgoing the heavy dependency on System.Web. 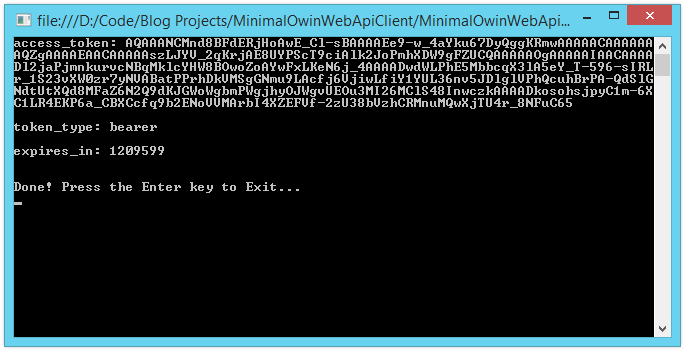 The Microsoft.AspNet.WebApi.OwinSelfHost Nuget package installs a few new references into our project, among them Microsoft.Owin.Hosting and Microsoft.Owin.Host.HttpListener. Between these two libraries, our application can now act as its own host, and listen for HTTP requests over a port specified when the application starts up. As we can see, all we are really doing is setting up our default routing configuration here, similar to what we see in the standard VS template project. However, instead of adding the routes specified to the routes collection in the ASP.NET pipeline, we are instead passing the HttpConfiguration as an argument to the app.UseWebApi()extension method. In the above code, for the moment, we are simply mocking out a data store using a List<Company>. Also, in a real controller we would probably implement async controller methods, but for now, this will do. Most of the structure above should look vaguely familiar, if you have worked with a Web Api or MVC project before. Now all we need is a suitable client application to consume our self-hosted Web Api. We’ve written (rather hastily, I might add) a crude but simple client class which will exercise the basic API methods we have defined on out Web Api application. We’re working against a mock data set here, so we take some liberties with Id’s and such in order to run and re-run the client application without running into key collisions. We see in the above, we created a convenience/factory method to provide an instance of HttpClient as needed, pre-configured with a base Uri matching the route for the ClientController in our Web Api. From there, we simply define a local method corresponding to each API method, which we can use in our console application. We see just about what we expect, given the code we have written. We query our Web Api for a lit of companies. We then add a new company, and refresh the list. Then we update the company we just added, review the list yet again. Finally, we remove the company just before the new company in the list, and review the list one last time. So far so good. However, a Web Api (even a small, self-hosted one) is of little use without some mechanism to persist and retreive data. 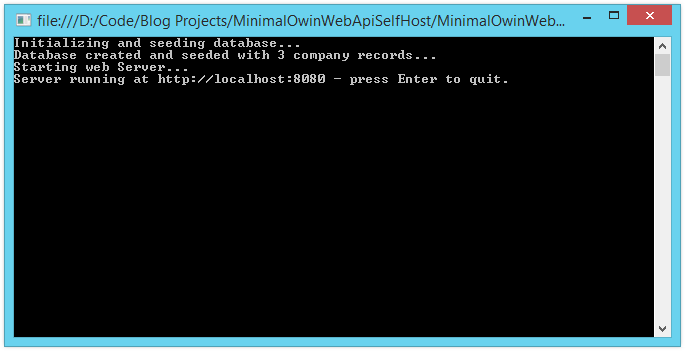 We can add a database, and use Entity Framework in our self-hosted Web Api. Since we are self-hosting, we may (depending upon the needs of our application) want to also use a local, in-process database as well (as opposed to a client/server solution) to keep our Web Api completely self-contained. Ordinarily I would go to SQLite for this, but to keep things simple we will use SQL CE. 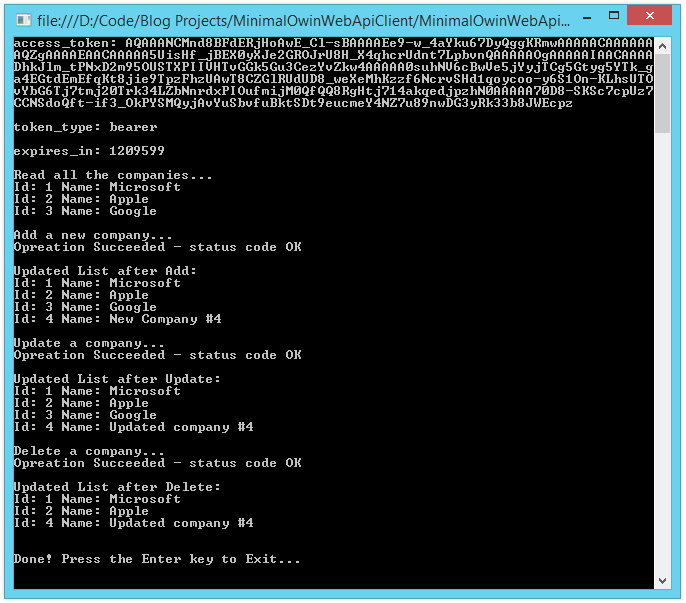 There is an Entity Framework provider for SQLite, however, it does not play too nicely with EF Code-First. You can use SQLite with Entity Framework if you don’t mind creating your database manually (or employing some work-arounds to get things working with code first), but for our purposes, SQL CE will do. With that done, let’s do a little housekeeping in order to pave the way for our new database. Now we need to set things up so that the database initializer runs each time the application starts (at least, during “development”). Now we need to make some changes to our CompaniesController. 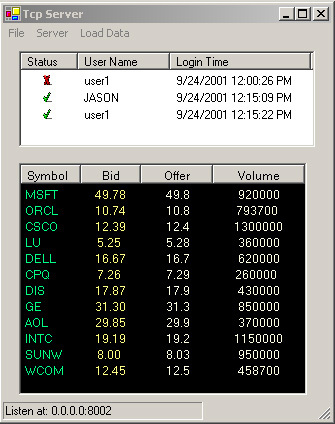 Previously, we were working with a list as a mock datastore. Now let’s update our controller methods to work with an actual database. Also, we will now use async methods. Note that we need to add a reference to System.Data.Entity in our using statements. Last, we need to make a couple minor changes to our client application, since we are now working with a database which will insert auto-incrementing integer Id’s. Now all we are doing is using the next Id as part of a hacked together naming scheme (and this is NOT a good way to get hold of the next Id from your database, either . . .). In this post, we’ve seen how to assemble a very simple, and minimal ASP.NET Web Api application in a self-hosted scenario, without IIS, and without taking a dependency on the heavy weight System.Web library. We took advantage of the OWIN/Katana middleware pipeline, and we saw how to “hook” the Web Api components into the host/server interaction. Next, we will investigate how we can apply these same concepts to build out a minimal footprint Web Api while still hosting in an IIS environment, and we will see how to bring ASP.NET Identity in to add some authentication and authorization functionality to the picture. 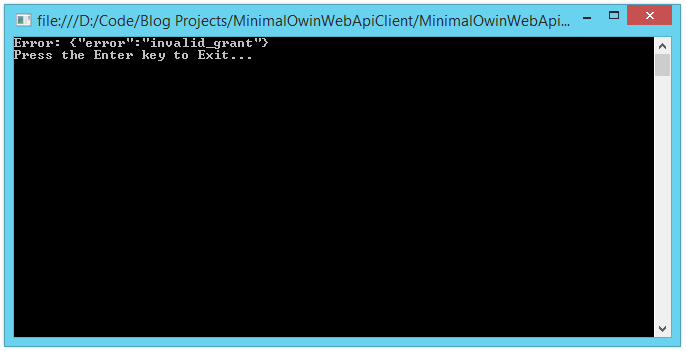 Recently we looked at the fundamentals of the OWIN/Katana Middleware pipeline, and we then applied what we learned, andbuilt out a minimal, OWIN-Based, self-hosted Web Api. In doing so, we managed to avoid the heavy weight of the System.Weblibrary or IIS, and we ended up with a pretty lightweight application. However, all of the concepts we have discussed remain valid no matter the hosting environment. But what if we want to add some basic authentication to such a minimal project? Once again, we are going to see if we can’t apply what we’ve learned, and pull a very small Authentication / Authorization component into our minimal Web Api application. We’ll start by implementing a basic authentication/authorization model without using the components provided by the ASP.NET Identity framework. Identity is fully compatible with the OWIN Authorization model, and when used in this manner, represents a very useful, ready-to go concrete implementation. But we can perhaps better understand the structure of OWIN authorization, and application security in general, if we start with simple concepts, and work our way up to concrete implementations and additional frameworks. In this series of posts we will start with concepts, and slowly build from there. Part I (this post) – We will examine the basic OAuth Resource Owner Flow model for authentication, and assemble to most basic components we need to implement authentication using this model. We will not be concerning ourselves with the cryptographic requirements of properly hashing passwords, or persisting user information to a database. We will also not be using Identity, instead implementing security using the basic components available in the Microsoft.Owin libraries. Part II – We will mock up some basic classes needed to model our user data, and a persistence model to see how storage of user data and other elements works at a fundamental level. With that in mind, we will take this as far as we reasonably can using only the OWIN/Katana authorization components and simplified examples. Once we have seen the underlying structure for authentication and authorization in an OWIN-based Web Api application, THEN we will bring Identity 2.0 in to provide the concrete implementation. Branch: ef – Added Entity Framework and a local SQL CE database, also from the post ASP.NET Web Api 2.2: Create a Self-Hosted OWIN-Based Web Api from Scratch. The code in this branch is where we start from in this post. Branch: auth-minimal – The code built up throughout this post. Application Security is Hard – Don’t Roll Your Own! Implementing effective application security is a non-trivial exercise. Behind the simple-looking framework APIs we use, such as Identity 2.0 (or any other membership/auth library) is a few decades worth of development by the best and brightest minds in the industry. Throughout the examples we will be looking at, you will see areas where we mock together some ridiculous methods of (for example) hashing or validating passwords. In reality, securely hashing passwords is a complex, but solved problem. You should never attempt to write your own crypto or data protection schemes. Even a simple authentication mechanism such as we will implement here brings some complexity to the project, because authentication itself is inherently complex. Behind the simple-seeming framework API provided by frameworks such as ASP.NET Identity lies some crypto and logic that is best left as it is unless you REALLY know what you’re doing. That said, understanding how the pieces fit, and where you can dig in and adapt existing authorization / authentication flows to the needs of your application, is important, and forms the primary objective of this series. One of the commonly used patterns for authentication in a web application is the OAuth Resource Owner Flowmodel. In fact, this is the model used in the Web Api Template project in Visual Studio. We are going to implement authentication using the Resource Owner Flow from “almost scratch” in our OWIN-based Web Api application. The Resource Owner – For example, a user, or perhaps another application. The Client – Generally a client application being used by the resource owner to access the protected resource. In our case, the Client might be our Web Api Client application. The Authorization Server – A server which accepts the Resource Owners credentials (generally a combination of some form of credentials and a password, such as a User Name/Password combination) and returns an encoded or encrypted Access Token. The Resource Server – The server on which the resource is located, and which protects the resource from unauthorized access unless valid authentication/authorization credentials are supplied with the request. In the above, the Resource Owner presents a set of credentials to the Client. The Client then submits the credentials to the Authorization Server, and if the credentials can be properly validated by the Authorization Server, an encoded and/or encrypted Access Token is returned to the Client. The Client then uses the Access Token to make requests to the Resource Server. The Resource Server has been configured to accept Access Tokens which originate at the Authorization Server, and to decode/decrypt those tokens to confirm the identity and authorization claims (if provided) of the Resource Owner. All of this is predicated on the Resource Owner having been properly registered with the Authorization Server. It should be noted there that the OAuth specification requires that any transaction involving transmission of password/credentials MUST be conducted using SSL/TSL (HTTPS). We can put together a very stripped down example to demonstrate how the pieces fit together, before we clutter things up with higher-level components and any additional database concerns. To get started, you can pull down the source for the Self-hosted web api we built in the previous post. We’re going to pick up where we left off with that project, and add a basic authentication component. Recall that we had assembled a fairly minimal Owin-Based Web Api, consisting of an OWIN Startup class, a simple Company model class, and a CompaniesController. The application itself is a console-based application, with a standard entry point in the Main() method of the Program class. In that project, we had decided that since we were self-hosting the application, we would keep our data store in-process and use a local file-based data store. We opted to use SQL Server Compact Edition since it would readily work with Entity Framework and Code-First database generation. Therefore, we also added anApplicationDbContext. We can review our existing project components before we make any changes. Also in the Models folder is our ApplicationDbContext.cs file, which actually contains the ApplicationDbContextitself, as well as a DBInitializer. For the moment, this derives from DropDatabaseCreateAlways, so that the database is blown away and re-seeded each time the application runs. I actually changed the code for the original ApplicationDbContext since the previous post. I have added a static constructor which sets the Database Initializer when the context is instantiated. This will call the initializer the first time we hit the database. Now that we know where we left off, let’s see about implementing a very basic example of the OAuth Resource Owner Flow model for authentication. The Microsoft.AspNet.Identity.Owin Nuget Package includes everything we need to implement a basic example of the Resource Owner Flow, even though we won’t be dealing with Identity directly just yet. Key to the Resource Owner Flow is the Authorization Server. In our case, the Authorization Server will actually be contained within our Web Api application, but will perform the same function as it would if it were hosted separately. You can see we are overriding two of the methods available on OAuthAuthorizationServerProvider. The First, ValidateClientAuthentication(), is necessary even though in our case we are not validating the Client application (although we COULD, if we wanted to). We are simply calling Validated() on theClientValidationContext and moving on. In a more complex scenario, or one for which stronger security was required, we might authenticate the client as well as the resource owner. Where the meat and potatoes of our authentication process occurs is in theGrantResourceOwnerCredentials() method. For this part of our example, we’re keeping this simple. We have hacked an authentication process which basically compares the password passed in with the hard-coded string value “password.” IF this check fails, an error is set, and authentication fails. In reality, of course, we would (and WILL, shortly) implement a more complex check of the user’s credentials. For now though, this will do, without distracting us from the overall structure of things. If the credentials check succeeds, an instance of ClaimsIdentity is created to represent the user data, including any Claims the user should have. For now, all we are doing is adding the user’s name as the single claim, and then calling Validated() on the GrantResourceOwnerCredentials context. The call to Validated() ultimately results in the OWIN middleware encoding the ClaimsIdentity data into an Access Token. How this happens, in the context of the Microsoft.Owin implementation, is complex and beyond the scope of this article. If you want to dig deeper on this, grab a copy of Telerik’s fine tool Just Decompile. Suffice it to say that the ClaimsIdentity information is encrypted with a private key (generally, but not always the Machine Key of the machine on which the server is running). Once so encrypted, the access token is then added to the body of the outgoing HTTP response. 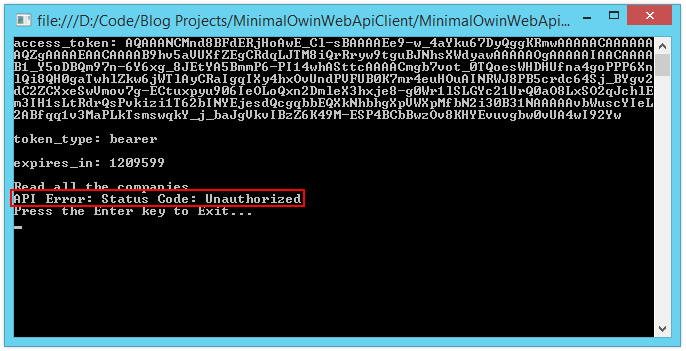 Now that we have our actual Authorization Server in place, let’s configure our OWIN Startup class to authenticate incoming requests. // Only do this for demo!! There’s a lot going on in the ConfigureAuth() method above. First, we initialize an instance of OAuthAuthorizationServerOptions. As part of the initialization, we see that we set the token endpoint, as well as assign a new instance of ourApplicationOAuthAuthenticationServerProvider class to the Provider property of the options object. We set an expiry for any tokens issues, and then we explicitly allow the Authorization Server to allow insecure HTTP connections. A note on this last – this is strictly for demo purposes. In the wild, you would definitely want to connect to the authorization server using a secure SSL/TLS protocol (HTTPS), since you are transporting user credentials in the clear. Once our authorization server options are configured, we see the standard extension methods commonly used to add middleware to IAppBuilder. We pass our server options in with UseAuthorizationServer(), and then we indicate that we want to return Bearer Tokens with UseOAuthBearerAuthentication(). In this case, we are passing the default implementation for OAuthBearerAuthenticationOptions, although we could derive from that and customize if we needed to. The server is added to the options object, which specifies other configuration items, and which is then passed into the middleware pipeline. Again, from the previous post, we had put together a crude but effective API client application to exercise our API. For this post, we are going to basically re-write the client application. Up to this point, we’ve ditched all the code that makes requests to the CompaniesController in our API, and we’re only looking at the code which authenticates us and retrieves the access token. Note, we have included some very rudimentary exception handling here. In a real application we would probably want a little more info, and we would need to incorporate a more robust mechanism for handling HTTP errors and other things that might go wrong. And we see that we have successfully retrieved an access token from our extra-simple auth server. But, what if we pass invalid credentials? Appropriately, we get back an error indicating we have provided an invalid grant. Now let’s implement the rest of our client, and try some calls into our API itself. Now that we are able to properly authenticate requests to our Web Api, we should be protected against unauthorized access, right? Since the browser request had no access token in the request body, the request for the protected resource was denied. With that, we have implemented a very basic example of authenticating a user with our embedded authorization server, retrieved an access token from our client application, and successfully requested access to protected resources on the resource server. Given we have added the Role restriction for access to the CompaniesController resource, this is what we expect to see. 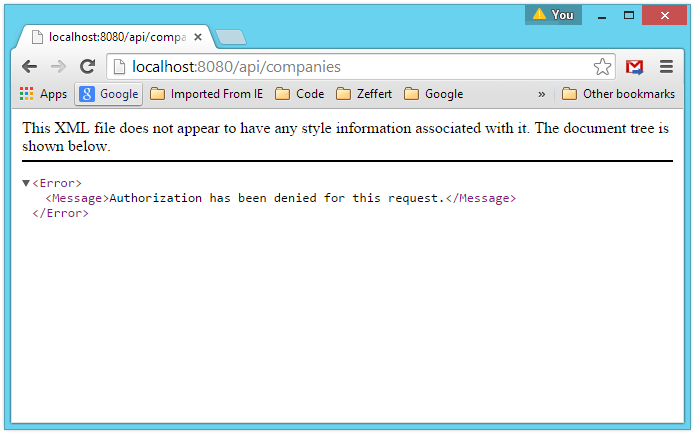 Now let’s see about authorizing access based on Role membership in our Web Api. With that simple change, we have now added a claim to the identity of the authenticated user. The claims will be encoded/encrypted as part of the access token. When the token is received by the resource server (in this case, our application), the decoded token will provide the identity of the authenticated user, as well as any additional claims, including the fact that the user is a member of the “Admin” role. We have once again successfully accessed a protected resource. Access to the CompaniesController is now restricted to authenticated users who also present a claim indicating they are a member of the Admin role. So far, we’ve seen in a very basic way how the Resource Owner Flow is implemented in the context of the OWIN/Katana pipeline. We have not yet examined where we might store our user information, how we get it there, or how our authorization framework might access that data. In the next post, we’ll look at persisting authorization information, and how we access it. Định dạng ảnh động GIF của công ty CompuServe đã 28 tuổi và chẳng có dấu hiệu gì là người ta sẽ từ bỏ GIF cả, nó được dùng rất rộng rãi ở khắp mọi nơi mặc cho những rào cản và lạc hậu công nghệ, ví dụ các lạc hậu là GIF chỉ hỗ trợ 256 màu, GIF có dung lượng rất to vân vân, tuy nhiên có lẽ do tính dễ dùng và thói quen khó bỏ, gif sẽ còn sống khỏe và sống lâu. Hôm nay mình xin giới thiệu với các bạn về kỹ thuật chia khung hình và lắc khung hình để tạo hiệu ứng 3D bằng ảnh GIF, hiệu ứng 3D này sẽ rất ấn tượng và khiến bạn ngạc nhiên, nếu bạn có hình nào 3D vui vẻ cũng chia sẻ với anh em nhé.